Black Bros. Co. enjoyed an incredible 2018 and 2019 is already off to a hot start. Check out our 2019 show schedule and come visit us at the following shows and conferences. Black Bros. is a presenting silver sponsor at the upcoming Structural Insulated Panel Association’s (SIPA) SelectSIPs Expo March 4-6 in Phoenix. Bill Masear of our Sales Team will be on hand to host a table top display at the Supplier Expo and explain how Black Bros. machinery can be used in the Structural Insulated Panel industry. Mark Thompson of our Sales Team will be on hand for the Expanded Poly-Styrene (EPS) Expo March 11-13 in Memphis, Tennessee. Mark will be exhibiting our literature on our roll coating and laminating equipment specifically designed for the EPS foam industry. Fifth-generation Black Bros. president Matt Carroll, Sales Director Todd Phalen, sixth-generation Black Bros. member Evan Carroll and Marketing Manager Evan Wixom will be attending the Woodworking Industry Conference April 2-5 on Amelia Island, Florida. 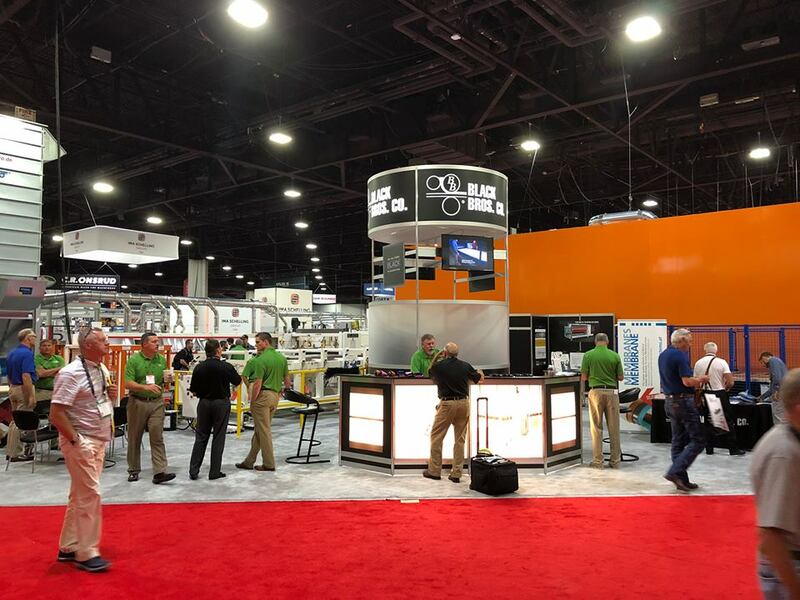 The Conference is jointly hosted by the Wood Machinery Manufacturers of America (WMMA), of which Black Bros. has been a member since the organization’s inception in 1949. In addition to several networking events, we will also be hosting a contact table at the conference. Todd Phalen is the Vice Chair of the WMMA Membership Development Committee and the WMMA International Business Development Committee. Black Bros. Sales Team members will be exhibiting a booth at the International Converting Expo April 9-11 in Louisville, Kentucky. Black Bros. will be in booth #1449 in the AIMCAL Pavilion as a member of The Association of International Metallizers, Coaters And Laminators. We will have information about our web coating and laminating equipment for many different industries for metal, plastics, foam and non-woven materials, to name a few. You can count on Black Bros. to custom engineer our equipment to meet your specific needs. Black Bros. will be exhibiting at the largest woodworking trade show in the world, LIGNA, May 27-31 in Hanover, Germany. Steve DeLong and Bill Masear with our Sales Team will be on hand in the WMMA Pavilion and will display one of our signature machines, a 22-D 650 Glue Spreader. We will also have a display of literature and videos showing Black Bros. Co. capabilities. 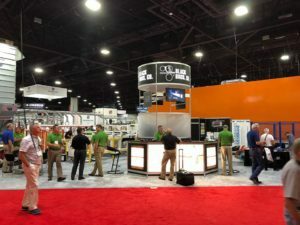 Black Bros. Co. will have equipment on display and live demonstrations during the American Woodworking & Furnishing Suppliers Fair July 17-20 at the Las Vegas Convention Center in Las Vegas. Located at Booth #7433, tentative plans are in place for Black Bros. to display our signature machine, a 22-D 875 Glue Spreader, a 775 Hot Melt Glue Spreader, and a TB-60 Hot Roll Laminator Line. Our entire Sales Team will be ready to discuss all your roll coating and laminating needs during this show. See you in Las Vegas! Bill Masear will be in Seattle October 26-29 for the Kitchen Cabinet Manufacturer Association’s 31st annual Fall Management Conference. In addition to networking events and manufacturing plant tours around the greater Seattle area, Bill will be able to meet with Kitchen Cabinet manufacturers and explain how they can benefit from Black Bros. Co. machinery. Steve DeLong, our Canadian Sales Representative, will be exhibiting at booth #2112 at the Woodworking Machinery & Supply Conference & Expo October 31-November 2 in Toronto. For more than four decades, the WMS Expo has been one of Canada’s premier Woodworking exhibition. Steve will have a large collection of literature and videos on hand to show why Black Bros. Co. machinery has earned an international reputation for impeccable quality and unmatched durability.